This was super fun to do with the kids and really it didn’t get too out of control. I helped them each make a few trees one at a time, and I let them pick which color sprinkles and star they wanted to decorate with. 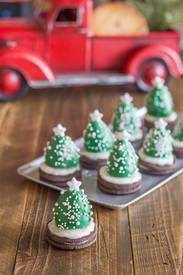 PS- of course I used tempered chocolate and chose to make many different colored trees!